1. Subscribe and participate in iMAES curriculum. 2. Contact your Country’s National Federation to take the iMAES exam. 3. Once you are qualified, you will be granted the award of e-certificate by your NF. You need to be logged in to see this part of the content. Please Login or Subscribe to access. 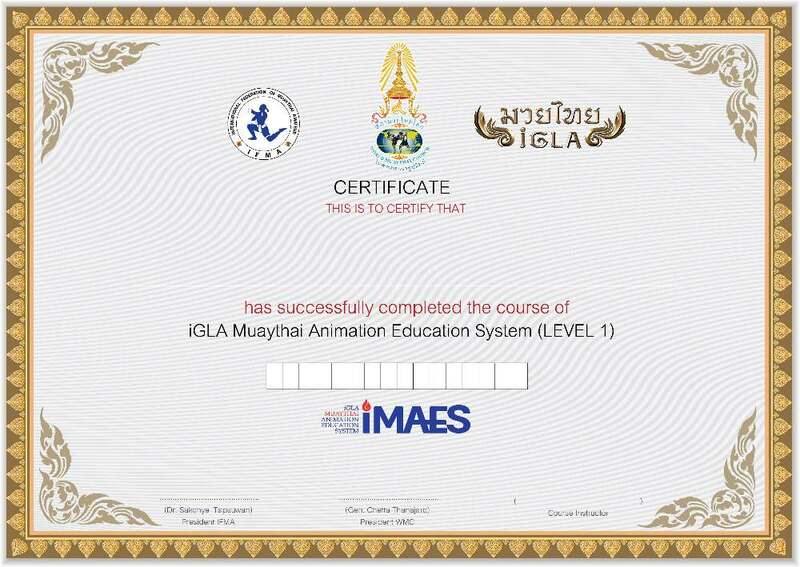 iMAES has arranged the award of certificates to students of Muaythai at all levels, with the endorsement of WMC, IFMA and Muaythai iGLA, which owns the copyright of the iMAES syllabus.Only the National Federation can access to the Certificate System. The certificates confirm the accomplishments of the students and should motivate them to pursue further study of Muaythai. Furthermore, students can continue studying Muaythai at any certified iGLA or iMAES gyms in any countries globally. The National Federation (NF) of Muaythai in each country is appointed to be the center of the curriculum for information, training, and granting certificates. You are responsible to be the center for students to take exam or evaluation. Once qualified, iMAES has arranged the award of certificates to students of Muaythai at all levels, with the endorsement of WMC, IFMA and Muaythai iGLA. iMAES certificate system will grant a unique certificate with individual information of each student. Khru Muaythai levels consists of 6 khans. The color of Mongkol is bronze, silver, silver-gold, and gold. WMC-IFMA will be the center to test and qualify students for granting certificates. © 2015 Muaythai iGLA, Muaythaiigla.com, and iMAES.net. All Rights Reserved. Unauthorized use and/or duplication of this material without express and written permission from this site’s author and/or owner is strictly prohibited. No part of this digital content, clips, graphics and other materials may be reproduced, distributed, or transmitted in any form or by any means, including copying, recording, or other electronic or mechanical methods, without the prior written permission of the owner, except in the case of brief quotations embodied in critical reviews and certain other noncommercial uses permitted by copyright law. Excerpts and links may be used, provided that full and clear credit is given to Muaythai iGLA and iMAES.net with appropriate and specific direction to the original content. For permission requests, write to the owner, addressed “Attention: Permissions Coordinator,” at the address below. Muaythai iGLA Company Limited Thailand.